It is believed that Moksha is certain for those who stays for just 1 kadigai (24 minutes) at this place. Saptarishis desirous of having darshan of Nrisimha performed Tapas here and were rewarded within one kadigai. Hence this Kshetra is called Kadikachalam and Tirukadigai. Vishwamitra obtained the title of Brahmarishi when he worshipped Lord Nrisimha here for a kadigai. On the hillock nearby is the Sannidhi of Karudaruda Varadaraja. This is an important prathana sthala. People come here for warding off evil spirits. The Moolavar on top of the hill (500 ft) is Yoga Narasimhar (Akkaarakani) seen in seated posture facing east. Theertham - Amrutha Theertham, Thakkan Kulam. It is also believed that Vishwamitra maharishi worshipped the Lord here for 1 kadigai & attained the Brahmarishi status. There is a sannadhi for Varadaraja Perumal with Garudan on the banks of the tank on the way to the top. There is a popular belief that worhsip at this sthalam will rid devotees of diseases and mental disroders. The utsavar at the foot of the hill is Bakthavatsala Perumal (Thakkan). There is a sannadhi for Adikesava Perumal behind the utsavar. There are also sanndahis for Andal, Erumbiyappa, Thottachariyar. The Anjaneyar on the smaller hill is Yoga Anjaneyar with Changu & Chakram (four arms). This Kshetra owns the pride of Lord Anjaneya with Shanku(The Divine Conch) and Chakra(The Divine Sudharshana Chakra). The Utsava Murthy of this Kshetra is located in the foothills within the town. Yoga Narasimha Sannidhi is located atop a hillock(350 ft high). Lord Anjaneya Sannidhi is located atop a hillock(200 ft high) directly near the Yoga Narasimha Sannidhi. The Big Mountain (Periyamalai) is about 400 feets high where Moolavar - Yoga Narasimar is found in Irundha (sitting) kolam facing his thirumugham towards East direction. 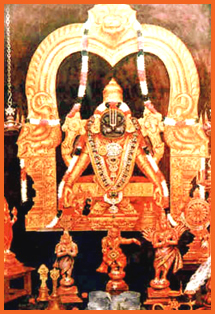 The other names of the Perumal are "Thakaan" and "Akkarakani". Akkaram means Money and Wealth. This sthalam is also called as "Kadikasalam". This sthalam is also named as "Kadigachalam". If we travel from Chennai, we have to first travel to Arakkonam. From their, by travelling about 25 Kms , we can reach this Sholingar. Lots of bus facilities are available from Arakkonam and lots of passenger trains stops at Sholingar station. The Malai Adi Vaaram (Bottom of the Mountain) of this temple is called "Konda Palayam". Konda means Hill and Palayam means a town.